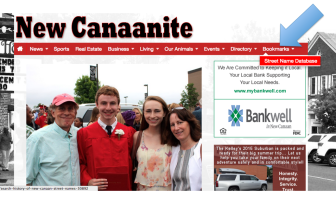 NewCanaanite.com has partnered with the New Canaan Historical Society on a digital Street Names Database that lets readers look up the origins of local street names online. With information drawn from a 1960 annual of the member-supported Historical Society, the searchable database is a drop-down menu (above) that captures information on how New Canaan streets got their names, in a snapshot from that year. The Historical Society has taken the further step of building out a completely updated list—should residents seek information that’s missing from the database (such as more modern street names) or want to review in greater detail what’s included in it—and that’s all available in the organization’s research library at 13 Oenoke Ridge Road (top of God’s Acre). You didn’t include the street I grew up on Running Brook Ln. Thanks Kim. When did you grow up there? 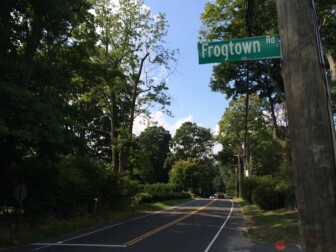 For any street created since 1960, you will be able to get information on how it was named at the New Canaan Historical Society’s research library (13 Oenoke Ridge Road). Under our partnership with the historical society to produce this database, researchers there did the legwork of pulling together all of that info. Running Brook Lane did not exist until the late 80’s or early 90’s. The property was part of a Franciscan Monastery that stood on the site up until that point. The New Canaan Historical Society can help you with learning how the “Running Brook” name was chosen as well as provide an in-depth history on the Monastery itself. I knew about the Monastery as there are still parts and stairs to it in the woods. Our house was built from 92-94. I just think that it would be great to eventually include all of the street names! Thank you for the information! That is fascinating Kim! I’ve often thought about doing an 0684-OLD story about the monastery but have not gotten around to researching it. The fact that there are remnants still there might be enough to do one, and then we will definitely update the database. Thank you for this information. My great grandfather was a Monk at the Franciscan Monastery back in 1934. I was looking for information on the Monastery and perhaps finding some information on him. He was born in Ireland and we are trying to trace our family tree. I know Proprietor’s Crossing wasn’t around in 1960 but I’m curious as to whether there is any information on why it was named that. It was a big word to learn how to spell back in 4th grade. Alanna, the New Canaan Historical Society has done all research for streets created after 1960 and it’s available for your review in the organization’s library. I believe Proprietor’s Crossing was once a trail that continued to Rte. 124.